Does The Viavito Sumi Folding Rowing Machine Offer More Than Just That Space Saving Design? 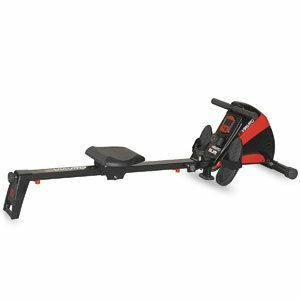 The Viavito Sumi Folding Rowing Machine definitely comes across as a low profile model. In fact, there is hardly anything to it at all. There is fairly long rail with a minimalist seat on board, a small case for the all the mechanics and electronics, the handlebar and cord for some resistance training, some small footplates neatly on the side and a tiny display. This red and black model is clearly designed as a space saving model for he apartment, with that folding frame adding to the compact nature. Does this key selling point detract from the purpose of this machine, or is this a great option for the home gym?